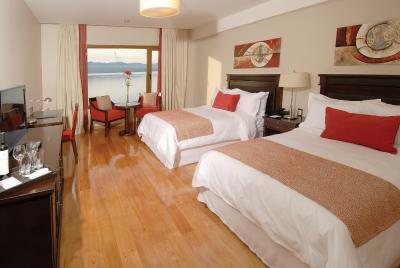 Lock in a great price for Alma Del Lago Suites & Spa – rated 8.7 by recent guests! Location was fenomenal as is close to civic center. Nice view to the lake. Night shift personnel was super friendly and supportive. The staff starting with Christian( he is the Best) at the front desk, and the wait satff in the restaurants (Laura, Daniel, and Sebastian are awesome. 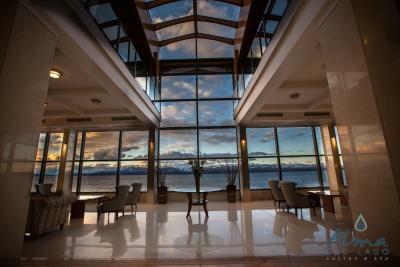 Location, views of the lake, facilities, attentive staff, close to downtown. Good breakfast. The front staff was very helpful with directions, day trip suggestions and restaurant reservations. The view and the location are unbeatable when put together. 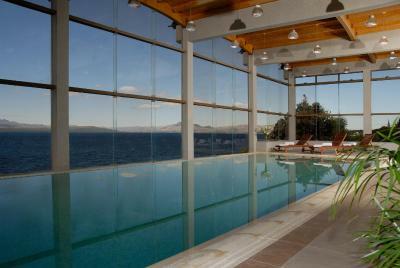 The indoor swimming pool with a view lake is also an experience on its own. Beautiful modern property with amazing views. All amenities - restaurant, pool, gym, bar area - are built with view in mind. Comfortable beds with a variety of pillows and new thick towels, Not right downtown but close enough to walk. Holding room for skis and snowboards or luggage prior to check in. Professional efficient staff. 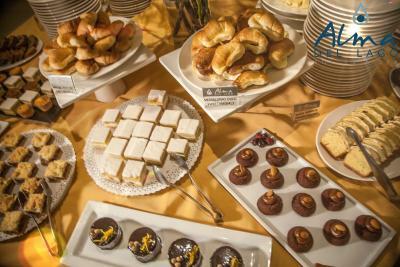 Alma Del Lago Suites & Spa This rating is a reflection of how the property compares to the industry standard when it comes to price, facilities and services available. It's based on a self-evaluation by the property. Use this rating to help choose your stay! 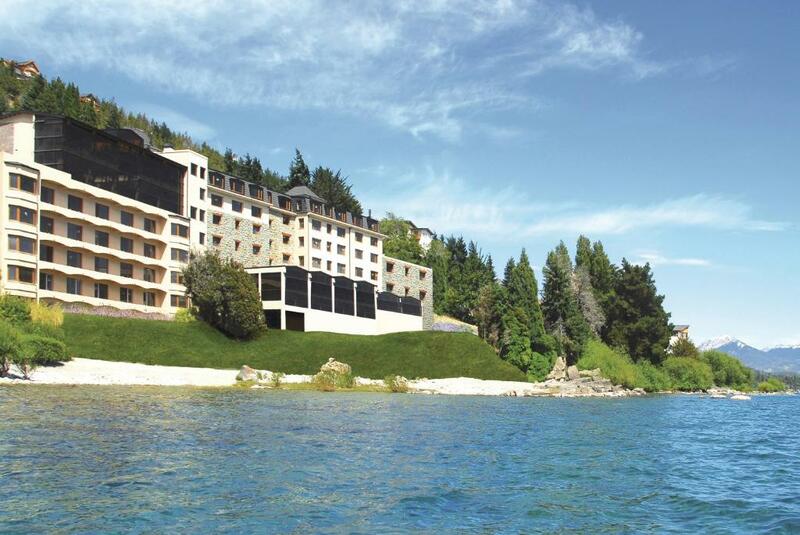 One of our top picks in San Carlos de Bariloche.The Alma Del Lago Suite offers modern accommodations with panoramic views of Nahuel Huapi Lake and extensive spa facilities. 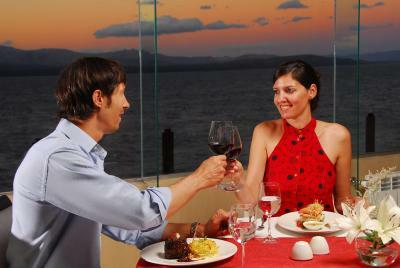 It features a fine dining restaurant and wine bar. 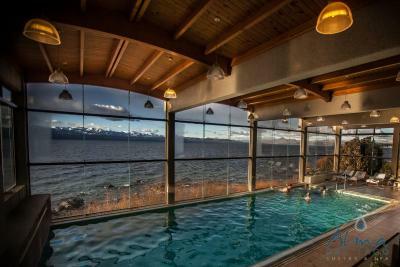 Spa & Relax features an indoor pool with a hot tub. 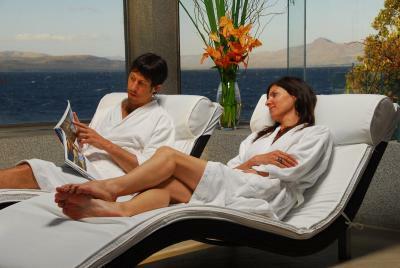 It offers facial and body treatments, massages and sauna facilities. 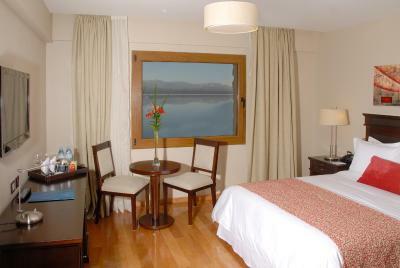 Rooms at Alma Del Lago Suites & Spa are fitted with a seating area and a flat-screen TV with cable channels. 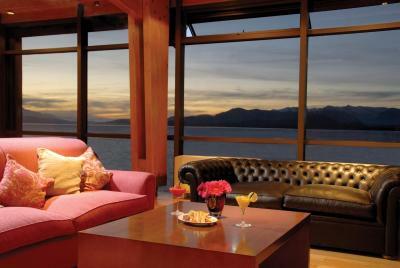 They feature large windows offering views of the lakes and Cerro Catedral Mountain. Guests can enjoy a Mediterranean-Patagonian cuisine menu at Terra Restaurant. All accompanied by a wine from the restaurant's private collection. Catedral hill is 12 mi away. Free parking is possible on site. 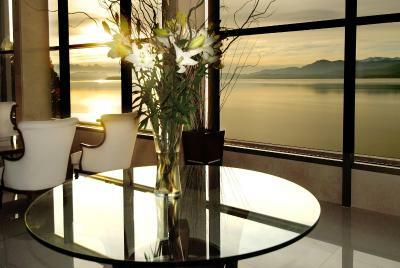 When would you like to stay at Alma Del Lago Suites & Spa? This room features a double bed. It includes a 32" flat-screen TV, minibar, heating, and a safe. This room can be fitted with a double bed or 2 single beds. It features a 32" flat-screen TV, mini-bar, heating and safe. It does not have lake views, but faces the street or has inside views of the property. 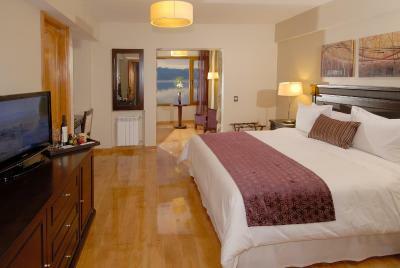 This spacious room has a flat-screen TV, a mini-bar and a safety deposit box. It features a bathroom with a bath tub and can be fitted with 2 single beds or 1 double bed. This spacious suite features a balcony. It can be fitted with 2 single beds or a large double bed. 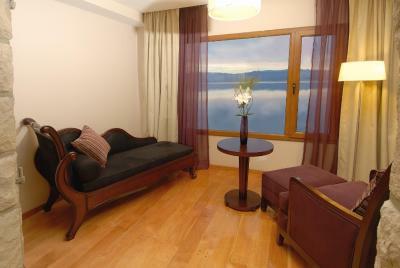 This large suite features a separate living area and a large double bed. 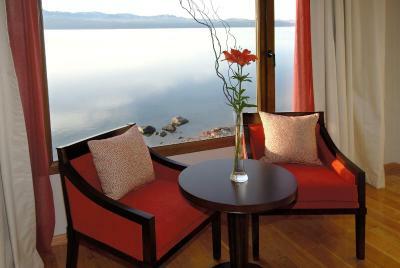 Alma del Lago Suite & Spa offers the comfort of being on the shore of Lake and proximity to the city . You can enjoy the most beautiful landscapes from the swimming pool , Gym , or enjoying a cocktail in our Mitico Bistro. House Rules Alma Del Lago Suites & Spa takes special requests – add in the next step! Alma Del Lago Suites &amp; Spa accepts these cards and reserves the right to temporarily hold an amount prior to arrival. 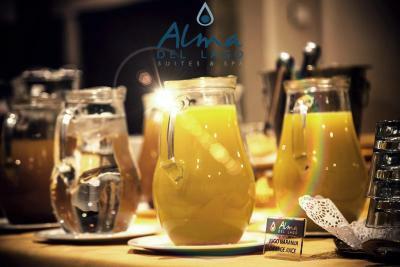 Alma Del Lago Suites & Spa accepts these cards and reserves the right to temporarily hold an amount prior to arrival. Please note that all reservations must be paid upon check-in. 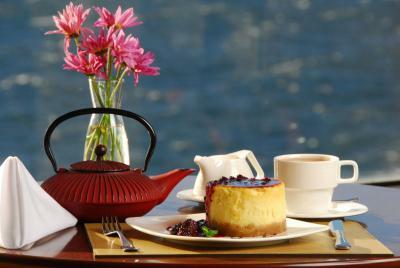 Would like less cakes and more vegetables in breakfast. Day shift personnel not as friendly and supportive as the night shift. Breakfast personnel not supportive at all. Check-out time. The walk into town was a bit unpleasant on a busy, dusty road. Huge, comfortable room with incredible lake views. Helpful staff giving suggestions for activities in the town. Breakfast could be more diverse. Check in was a bit long. 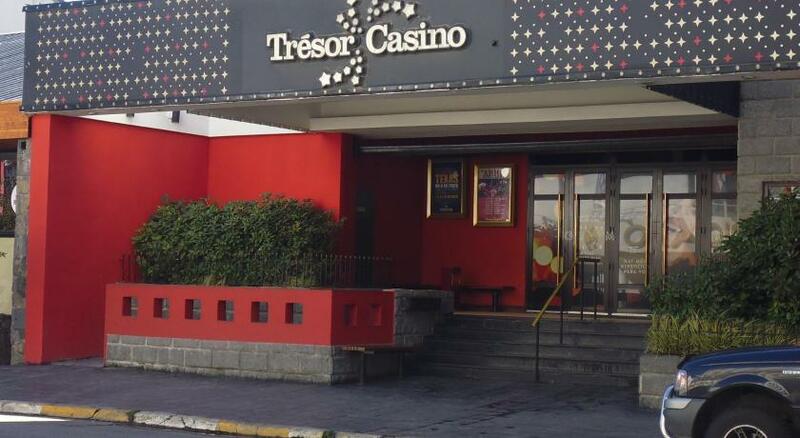 Good location, 10-15 minutes walk to city center. Good view from room on lake. Clean hotel, good house keeping. Good bar upstairs. Nice hall and all hotel is very beautiful. Nothing. It was a good experience in all respects. The location is perfect. 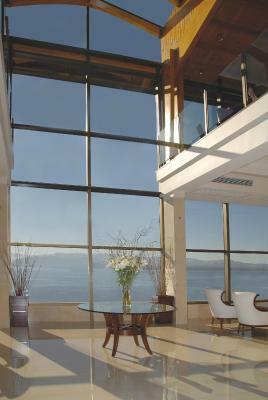 Right on the lake with panoramic breath-taking views. Soothingly quiet and peaceful, on the right side of town for activities and just a 5 minute walk into the main streets. Look no further than this hotel. Oh, and the staff are professional and committed to excellence. 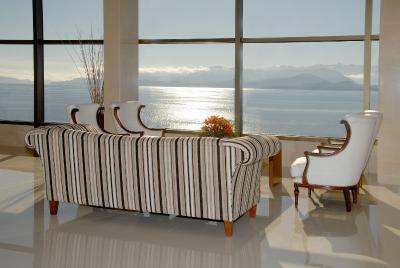 The personnel is always polite and friendly, during our stay they were attentive to our requests. The hotel is spotless and I can't imagine a better view to enjoy while having breakfast, which btw is very complete and full of options. The restaurant and bar in the hotel are excellent. 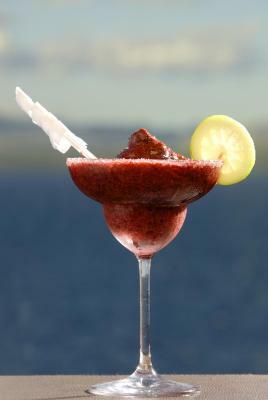 The restaurant has gourmet dinners that are top notch and the bar is a great place to have drinks. I'll definitely comeback to this hotel in my next trip to Bariloche. The fact that we paid upfront for a standard room, we checked with your organisation the night before and found we had paid the price of a luxury room. We asked at reception but they had allocated us the standard room. The room was adjoining, next door we had some very loud people, who kept us awake and woke us up at 1.00am... we are not happy with booking. Com.. we’ve used your company a lot for our travel but we won’t be using you again. 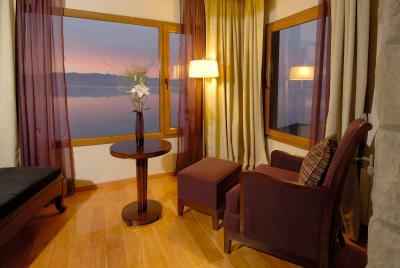 Our room was on the top floor and had a fantastic view over the lake. Pay the premium to get a lake view. It’s worth it. Staff were efficient and helpful. The restaurant also had a stunning view over the lake. One night we were the only guest yet the food was excellent. Breakfast was adequate. Food was only fair and because we were there Xmas if you didn’t buy their expensive Xmas eve dinner no other place to eat. 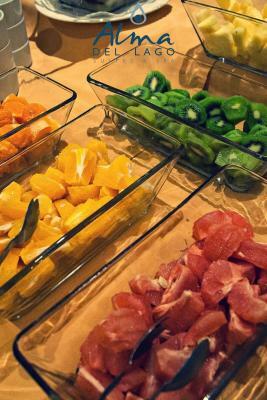 Bar had two choices and buffet breakfast minimal. Staff not very accommodating.